Also known by the names Tiruchirapalli and Trichy, this geographic center of Tamil Nadu is not only the travel junction, but a great amalgamation of must see temples and the throbbing bazaars. It is the booming trade center of Tamil Nadu. Positioned on the banks of Cauvery River, Tiruchirapalli has an appealing intermingle of the past, traditions and religion. Once the bastion of the Chola kings, the eminent rock fort here has witnessed the ephemeral rules of different dynasties. The rock fort is a popular attraction of the city being a magnificent monument hovering on colossal rocky outcrops mount abruptly from the plain to soar over the primeval city. 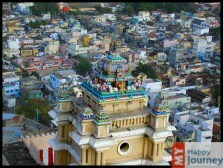 With a large number of temples and the famous rock fort this city has become a renowned tourist attraction of India. Cloaked under a miasma of coconut palms towards the north side of the city, the Sri Ranganatha Swami temple is among the largest and most interesting temples in India. Constructed on an island in the heart of the Cauvery River, it covers an area of around 2.5 square kilometers. Whether you are history lover, nature enthusiast or a shopaholic, this city will not disappoint you. Traditional handicrafts of Tamil Nadu can be bought in Trichy. With Government run emporia and private shops in abundance, there are a number of shopping options in Trichy. It is also renowned for artificial diamonds, handloom cloth, glass bangles, cigars and toys made up of wood or clay.